With approximately 5,000 residents, Bad Aussee is considered to be the most "urban" town in the Ausseerland region within the Styrian part of the Salzkammergut. Like other settlements in the area, Bad Aussee was heavily involved with the local salt mining and trade industries and its name can be traced back to 1265. Throughout its history, the town benefited from the strong ties with Altaussee and its mines - which are no longer in use except as show mines. Similarly, it is tourists that replaced the salt in Bat Aussee, too. The core of the town is probably the Kurpark, with flower beds and greens and the obligatory Kurhaus (spa pavilion). This echoes the origin of tourism in the Salzkammergut: Viennese aristocracy that wanted to escape from the busyness of the big city and found peace and natural beauty in this region. You can still feel the fin de siecle atmosphere of these days in Bad Aussee, and be it through the strategically applied cues from the tourism board: memorials, classic concerts and references to imperial celebrities keep the legend alive. One of them involved the Styrian local hero of Archduke Johann. The Habsburg with a soft spot for Styria loved the Ausseerland and was a Bad Aussee regular. It was here that he met his future wife, Anna Plöchl, the daughter of the local post officer. Since Anna was a peasant, the marriage caused quite a bit of controversy in Austria and Johann and his descendants were excluded from the succession to the crown. His wife was later ennobled, though. Anyway, you can see a "Erzherzog Johann" memorial in the Kurpark. Other sights include the Kammerhofmuseum in a Gothic court, which is more interesting than the average town museum. Here you can learn a lot on the local traditions and customs - people of the Ausseerland have a distinct local pride and their traditions are often ancient. The museum will teach you about Flinserln and Zacherln (local carnival traditions) as well as about the region′s obsession with folk costumes such as lederhosen and dirndl. The biggest annual event of Bad Aussee is the Narzissenfest, though - a folk festival that involves a parade of large carriages and boats packed with artwork made from ten thousands of daffodils (read more on this in "best of fest"). Gundlsee, Toplitzsee & Kammersee: "3 Lake Tour"
Beyond this, there is the "Mercedes Bridge", the most disgusting demonstration of corporate power since the invention of copyright (a round bridge bearing an enormous "Mercedes Benz" star) and the parish church St. Paul and the Gothic Spitalkirche Church in terms of attractions. 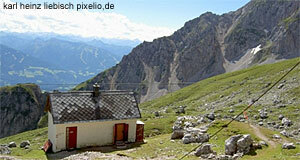 However, Bad Aussee makes a good starting point for excursions to the Lake Grundlsee. It is located only about four kilometres north of the town and can be accessed in a short hike. This little lake was another popular destination for Viennese aristocrats on vacation, including Sigmund Freud who loved to go mushroom picking in the nearby forests. The beauty of the landscape has long been commercialised and today, the local tourism industries like to market a "Three Lake Tour" or "Drei Seen Tour". Such a trip includes a stay at Lake Grundlsee, Lake Toplitzsee and Lake Kammersee ("See" means "lake", as might have guessed already). The Toplitzsee is said to be the one where the Nazis dumped a huge amount of gold - several diving excursions managed to retrieve bogus money, documents and other findings from the Nazi time, but no gold so far. A final piece of advice: Don′t let the tourism industry discourage you from going to the three lakes. They might be marketed in a less-than-charming manner, but are very pretty and it is definitely worth going there.